The November rain and winds has reduced the local downland to a grey/brown mire. 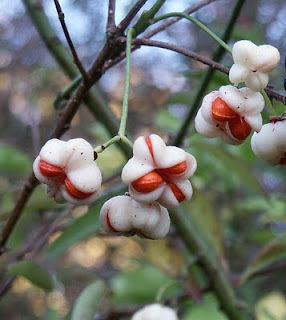 The last leaves have been ripped from the trees and the only remaining colour is from the fruit left on scrub species. Most of them are the black of Buckthorn, Privet and Dogwood but standing out amongst those are the scarlet/crimson fruit of Spindle (Euonymus europaea,left ). 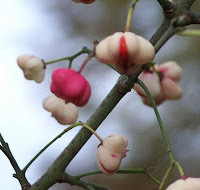 It seems to have been a very good year for Spindle on the Downs, some plants are still laden with fruit with the orange seeds protruding from the scarlet flesh. For some reason on Banstead Downs there are a good proportion of plants with fruit ranging in colour through to white, the latter being rather attractive (right). As far as I am concerned this is unusual in itself, I have never seen this anywhere else (other than gardens) not even on Park Downs close by. 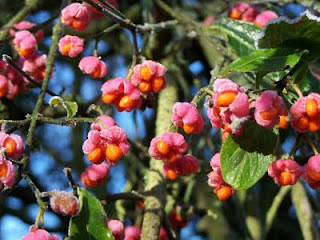 It has been suggested to me that it is quite likely that because Spindle used to be widely planted for its timber and perhaps in the dim and distant past someone rather liked a white variant that appeared and planted this rather than the more normal one, hence enriching the population. I am not too sure of this explanation, I suspect that planting for timber on common land (as Banstead Downs is) stopped a very long time ago but who knows. I have always rather simply assumed that colour variants usually result from a simple genetic mutation, in this case meaning the plant is unable to synthesize the relevant pigments to give the fruit its normal colour. However this year I have noticed a couple of plants with predominantly white berries but here and there just a single normal-coloured fruit (see poor picture taken in gloom, left) I assume this suggests it is a bit more complicated than that.